This is MaxGuide Milan 2018! The most independent, hipster, concise and easy guidebook to Milan. More beautiful than ever, updated to 2018, made by locals. 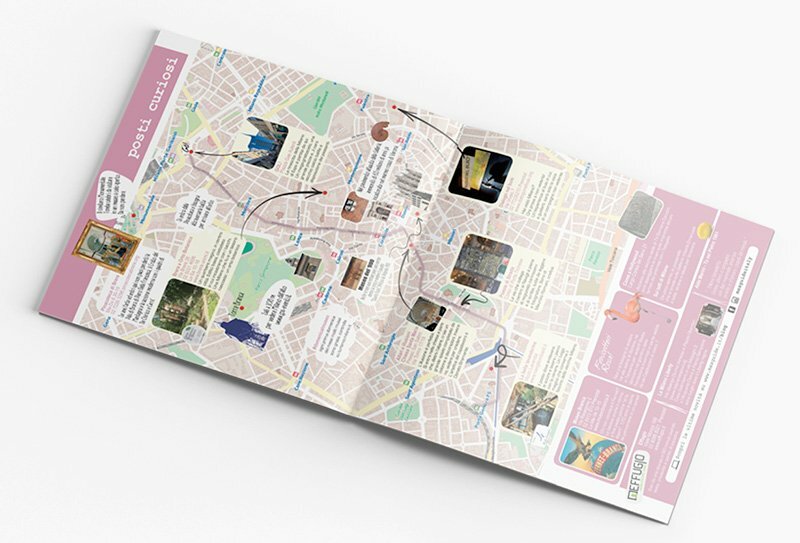 92 tips and 7 maps to discover the city’s attractions, best restaurants, shopping districts and fun spots for a day in Milan the Italian way. Short texts, only the useful info. Ideal if it’s your first time in Milan. Fold it, mess it up, enjoy it: it’s your guidebook to an unforgettable weekend in Milan. All the things to do in Milano are on a map: from the best restaurants to hipster shopping, to the best place to make out watching a sunset over the cathedral. Order it in English and receive it before leaving home! Receive it home far far away or at your hotel‘s reception in Italy! Shipping costs to Italy, 3 €; to Europe/UK, 5 €; to the US 15 €. No store chains or tourists’ coffee shops: just the best indie places only a friend could show you. And I am that Italian friend you’ve longing for. Not only it’s super up to date: it’s linked to a page with the Milan Spotify playlist with the tracks I love, the Milan Google Map with all my tips and 3 extra secret spots only you will discover. 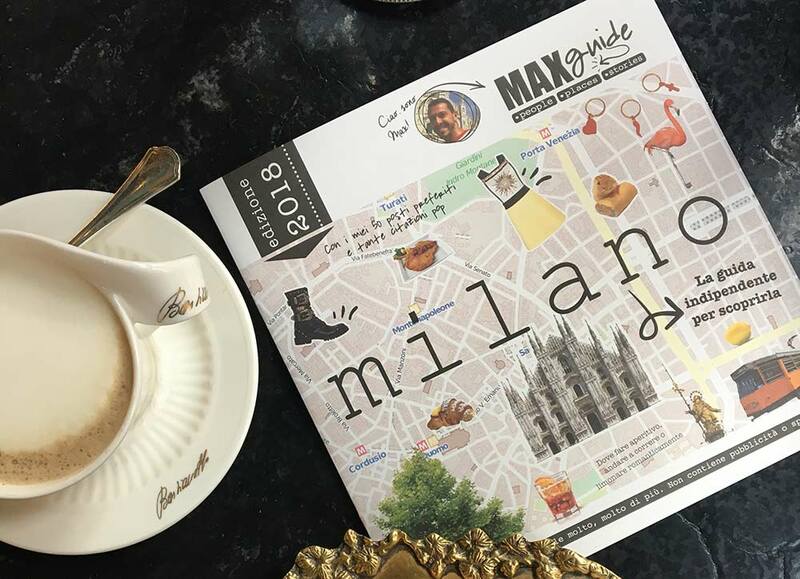 Strolling around Milan with MaxGuide in your hands is just the best. Printed on beautiful 100% recycled paper, you can hold it with one hand, mess it up with your notes or fold it to fit in your jeans’ pocket. No stress, more fun. Enjoy a day out to discover the surroundings of Milan. On the countryside, at the lake Como and Maggiore, in a jacuzzi or hunting for hidden gems. Movie quotes, poems, songs and my own memories linked to Milan. All of our tips are on the maps. No more need to browse back and forth all the time! Short texts, a few sections. Your time is precious and we want you to enjoy Milan in 1-2-3. Milan is just your starting point to discover unexpected places like the beautiful Maggiore Lake or world-famous Monza. Order it in English and receive it before leaving home or at you hotel’s reception! Milan: what to do?If you’re visiting Milan for the first time, you might feel overwhelmed with so much to see and to enjoy. Where to eat in Milan? What to do at night? What are the shopping secret spots in Milan? I wrote this guy to help you feeling like an Italian, without the stereotypes. From the City Life district with the new skyscrapers and The Mall to Gas Aulenti square, from Navigli to Brera, from the Castle to the Duomo. Milan weather?Weather in Milan is not an issue: our tips go from summer to winter, with the sun or with the rain. Enjoy the city’s pools during summer or ice skating during wintertime. How do you get to Milan?By plane at Malpensa, Linate, or Orio al Serio airports or at the Central Station, you’ll find all info on how to discover the city without a car, even with the help of the exclusive Expo 2015 Milan metro map. Events in Milan?Even when Milan is full of events like the Milan Fashion Week or the Milan Furniture Fair, or Milano Film Festival, you can still enjoy a hidden Milan, far from the spotlights and the movida. Or, enjoy the Milan to drink, a famous pay-off of the 80s which underlines how Milan has always been a social city. There are so many insider tips for the kind of Milan you want to discover. Milan by night is even more beautiful: visit one of the seven spots I found and enjoy feeling like a local. What are the best restaurants in Milan? With so much choice, you really risk to miss what’s typical and post-modern at the same time. That’s why I chose 7 of them where you will hardly find any tourist. Discovering Milan like a local is an opportunity you can’t miss. Tasting typical food: from the yellow saffron risotto to pizza. Do you know that peperoni in Italian means peppers? What you might be looking for is a “pizza al salame”. And then, sushi bars, fashion restaurants, pan fried pork cutler, that we call cotoletta alla milanese.